I recreated the events surrounding my brain aneurysm rupture that resulted in a massive right-sided cerebral bleed from medical records and witnesses. August 15, 2007 was a typical day. I went to work and then to the dentist in the late afternoon. I returned to work with a slight headache and was still numb from the anesthesia. I chatted with my coworkers and took a drink of water from a glass and we all started laughing because water was dribbling out of the left side of my mouth. I returned to my usual work duties and my office. I really started feeling terrible and concerned; I called my coworkers to come to my office. I was sweaty, pale, lethargic, and had an altered level of consciousness. The right side of my head hurt a lot, but fortunately, I do not remember the pain. My coworkers got some ice for my head, and I wanted to lie on the floor of my office. The owner’s son and my coworker called 911 when my eyes started to roll back in my head. The paramedics arrived within 1 minute of the phone call. The last thing I remember hearing was the siren from the ambulance. Apparently, I did have a short conversation with the paramedic, fell into a deep coma and stopped breathing. The paramedics resuscitated me. Then, I was transported to the nearest hospital. Kenny, the paramedic that resuscitated me. This photo was taken 3 years post injury, in my office….the site of my aneurysm rupture. Thank you, Kenny! At this second hospital, the neurosurgeon did not even show up. What the heck? They were going to put me in a room and wait until morning. By that time, my parents arrived to the second hospital and knew something should be happening so they advocated getting me transferred to a university/teaching hospital. Luckily, UCSF accepted me and, I was flown by fixed wing to SFO, then ground ambulance to UCSF. At bedside, they urgently placed an external ventricular drain (EVD) to reduce the extreme intracranial pressure (ICP). This relief from ICP was 10 hours after the initial rupture. I was diagnosed with a Hunt and Hess Grade 5 subarachnoid hemorrhage due to a ruptured aneurysm on my right Middle Cerebral Artery (MCA). Hunt and Hess is a 5 point scale to determine the severity and projected neurological outcome from a subarachnoid hemorrhage. Grade 5 gave me a 10% chance of survival and a poor prognosis of outcome if I survived. 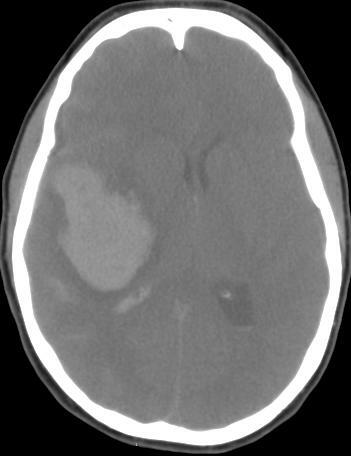 I also had a 5.6 cm by 4.4 cm (large) blood clot (hematoma) at the aneurysm rupture site which pushed my brain 8mm over to the left (midline shift). Blood was also pooling in one of my cerebral ventricles. While UCSF was reviewing my CT scan to determine if I was a candidate for surgery, I made a small movement with my right hand. Clinically, I should not have been able to move. Fortunately, an intake nurse (Jane) saw my hand movement, called the surgeon and told him something was still there. That small observation and phone call was the only reason UCSF decided to do the surgery. A very gifted Neuro-surgeon, Dr. Michael Lawton, performed a craniotomy, aneurysm clipping, and blood clot evacuation. Two aneurysms were clipped, a ruptured and an unruptured aneurysm. The ruptured aneurysm was estimated to be 7mm in size, whereas the unruptured aneurysm was 4mm in size. The bone flap was left out after the surgery to allow for my brain to swell as much as it wanted to without being confined within the skull. September 4, 2007, 19 days after the emergency craniotomy, my bone flap was replaced and a ventriculoperitoneal (VP) shunt was installed. The VP shunt helps me drain cerebral spinal fluid (CSF) from my brain into my belly, since my injured brain was unable to process CSF on its own. On September 11, 2007, 7 days later I was transferred to the Brain Injury Program at Alta Bates Hospital because the doctors and staff felt I would benefit from intensive neurological rehabilitation. This is a slide from my first ct scan. I will do my best to explain what I learned about my ct scan. A ct scan takes cross section images of the brain in layers. Doctors and Radiologists read these cross sections like a game of battleship to pinpoint the affected area and best course of action. This image is reversed. The left side of this image is actually the right side of the brain. The skull bone is the white halo. At the “widow’s peak” of the skull bone, there is a fine white line(Midline Falx Cerebri) shifted towards the left. 2) The white cloud is located in the right side of the brain, the black butterfly looking thing is on the left side. 3) Apart from the skull bone, white in a brain ct scan is a bad thing. The white cloud is the blood clot. The white bumpy texture is blood in the subarachnoid space, (the space between the brain surface and the skull bone). In actuality, this subarachnoid area usually has a black bumpy texture, cerebrospinal fluid, the blood brain barrier. Blood in the brain is a toxic irritant and is BAD. 4) The black butterfly thing (frontal horns of the lateral ventricle) should be symmetrical and centered in the middle. Notice the butterfly is smushed and pushed towards the left. Any way you looked at it, my CT scan was terrible. My first UCSF CT scan…10 hours after the initial rupture…right before surgery.